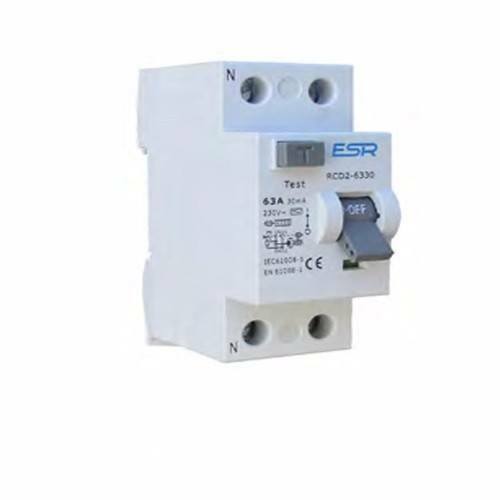 The Double Pole RCCB / RCD Breakers Type A from ESR are available in a range of amp ratings including 16 Amp, 25 Amp, 40 Amp, 63 Amp and 80 Amp. This range includes the RCD2/A-1630, RCD2/A-2530, RCD2/A-4030, RCD2/A-6330, RCD2/A-63100, RCD2/A-8030 and RCD2/A-80100 models. An RCD is a sensitive current breaker designed to protect the user and their property from electric shock and potential fires by breaking the current as is passes through your consumer unit in the event of a detected imbalance or disruption to current path. RCDs are known to save lives and are a commonly used component in domestic consumer unit configurations. These RCD modules will use 2 modules/ways on your ESR consumer unit rail bar, and will trip the entire circuit associated with it in the event of a detected fault. These modules are ideal for use with lighting/heating circuits in B curve (uses where switching surges are low or non-existent). These RCCB modules are designed to trip at a 30mA imbalance with 100mA options available. We advise consulting your electrician if you are unsure which current rating is right for your desired application, as the wrong type may cause unnecessary tripping or create a potential hazard.